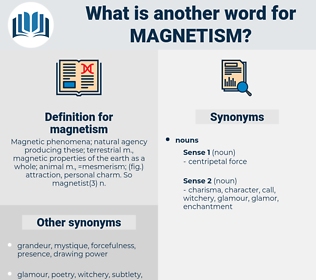 What is another word for magnetism? Magnetic phenomena; natural agency producing these; terrestrial m., magnetic properties of the earth as a whole; animal m., =mesmerism; ( fig.) attraction, personal charm. 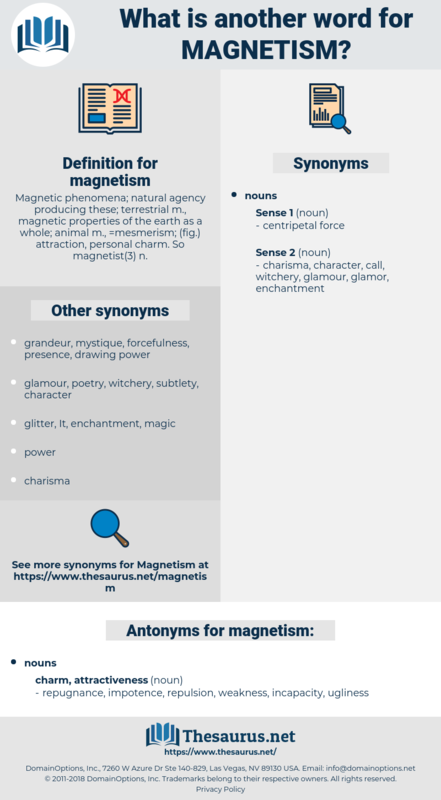 So magnetist( 3) n.
repugnance, impotence, repulsion, weakness, incapacity, ugliness. Another pause followed, during which the will of the man and of the woman seemed to meet and struggle, with strange magnetism, in the stillness of the dark house. His dinners felt the magnetism of his presence, and he showed especial skill in having, to meet his American guests, just the famous men in London life whom the American desired to know.